I recently turned 33, and the thought crossed my mind to do a small album just about me. My Project Life albums, while they're about the family as a whole, tend to include probably 90% Austin-related photos and stories. I thought it might be nice to focus solely on myself - my current projects, favorites, routines. So I started an album that I plan to work on over the course of several months. 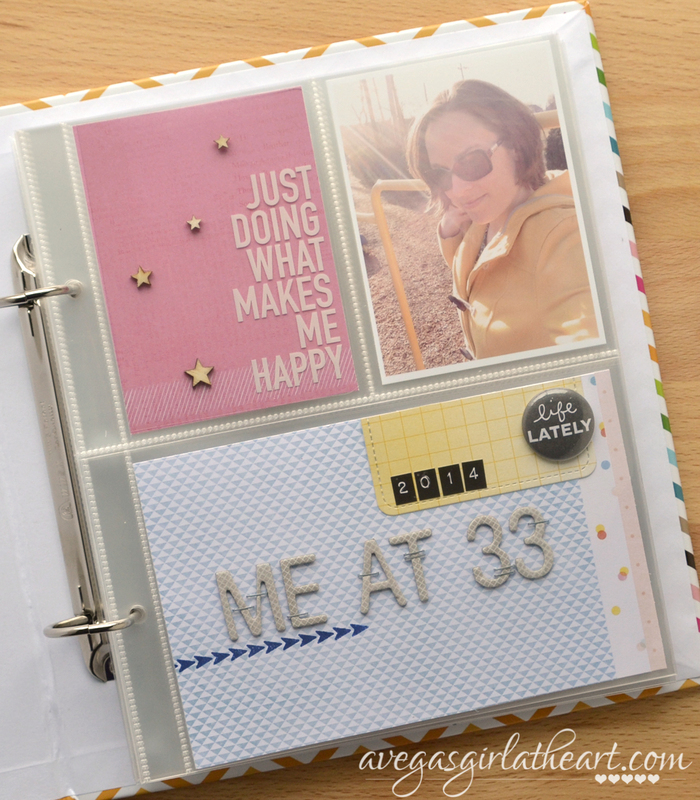 I picked up one of the Project Life mini albums, and filled it with leftover Simple Stories page protectors (I will probably cut down some of my larger Becky Higgins page protectors so I can have different orientations). 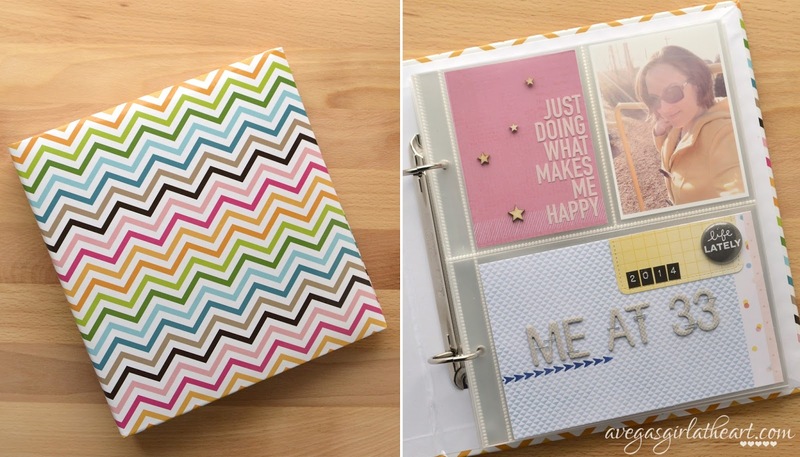 For this album, my plan is to use the Dear Lizzy Daydreamer Project Life mini kit and coordinating 6x6 paper pad, but it's likely I will add some other papers or journaling cards as I go along. For the cover page, I used a photo of me shortly before my birthday. 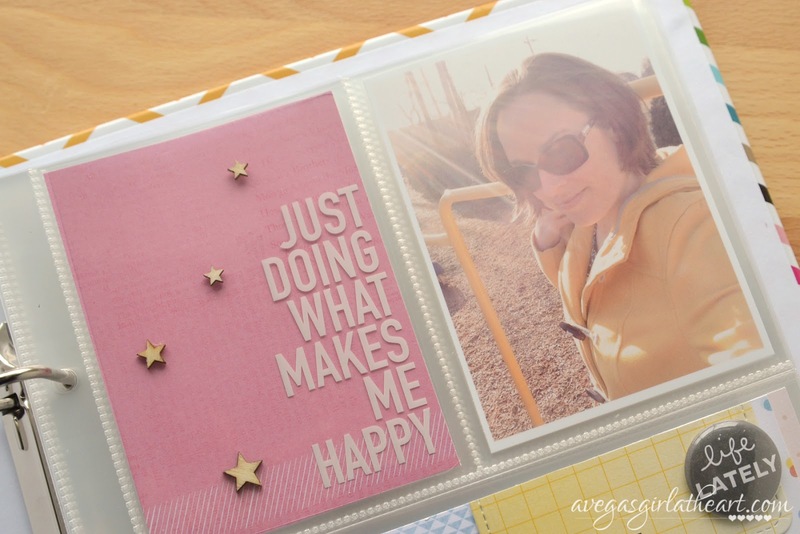 I just really liked the sun in the photo and thought that the yellow color went well with the Daydreamer collection. In the top left pocket, I cut down one of the 6x6 sheets to 3x4, and then added half of one of the Becky Higgins Project Life overlays on top. I used my Xyron to add adhesive to the back of some Studio Calico wood stars and attached those to the overlay, then slid everything into the pocket. In the bottom pocket, I cut more of the 6x6 paper and layered it. The total width is about 6.25 inches - because I have a little issue with the fact that there is extra room in the 4x6 pockets on the Simple Stories page protectors. (With the Becky Higgins page protectors, I've found that the 4x6 pockets are true to size but the 3x4 pockets are slightly thinner - these are opposite. The 3x4 pockets fit 3x4 exactly but leave extra space in the 4x6 ones). I used some Amy Tangerine thickers and attached them with my Tiny Attacher just to add some extra detail. 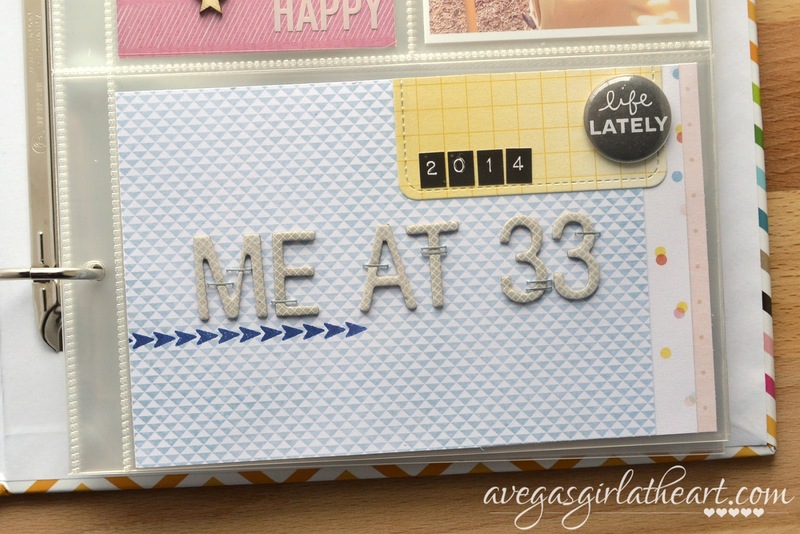 I stamped in Heidi Swapp navy a set of arrows (Studio Calico) underneath the title. 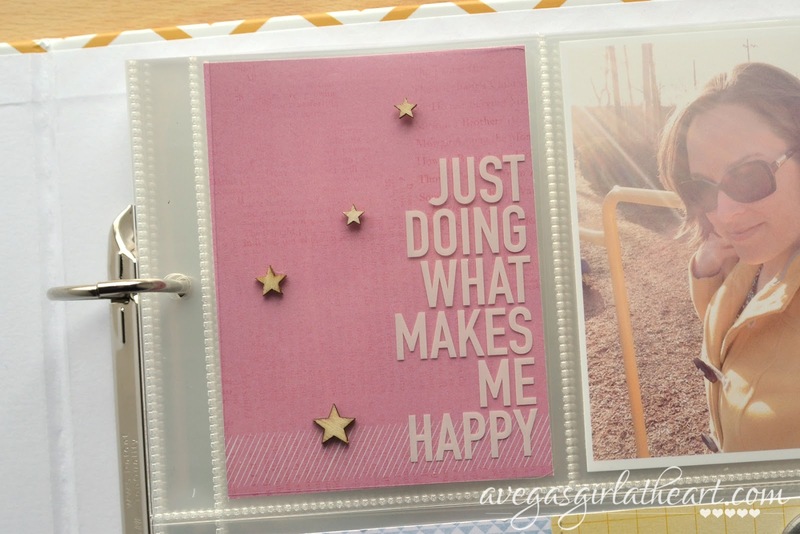 I used a Lawn Fawn die to die cut a label from part of one of the Daydreamer journaling cards. I love the stitched border on this die. 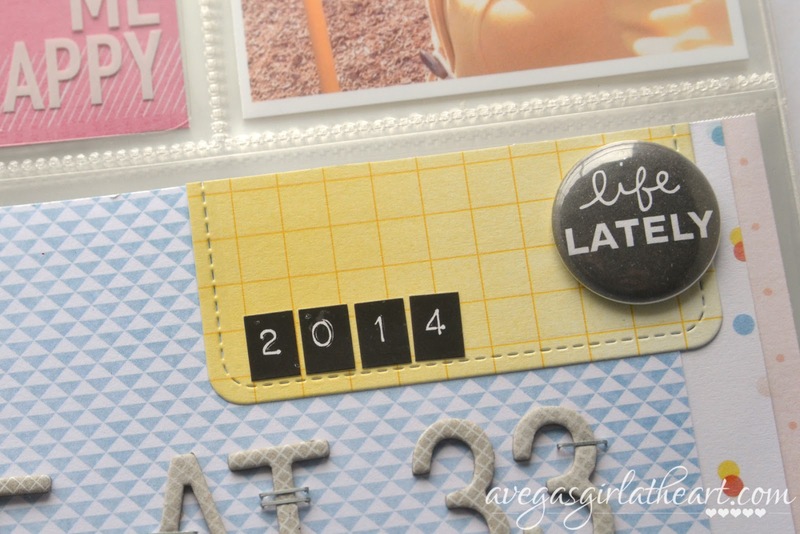 Then I added '2014' with some Simple Stories stickers and a flair button. I'm excited about this project, and I love that it's satistfying a little bit of that physical product craving I get from doing digital Project Life. I look forward to sharing more pages with you. I LOVE this! I like to think of us, sitting around at age 85, looking at these albums! :) You should do one too! That album is a Becky Higgins album? How did I miss that?!?! Yup - they only sell these particular ones at Michaels right now though. She does sell the mini leather ones on her site, but these are those paper-type covered ones and those are I think Michaels exclusives. Melissa, this is just beautiful! I cannot wait to see additional spreads for this album and love the kit you're using. Great work! 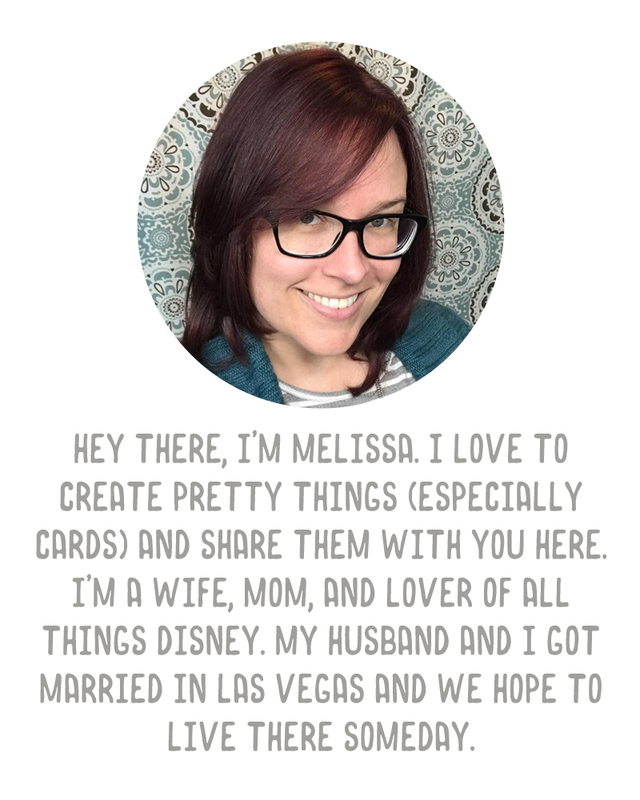 Love the concept Melissa..........and see how great you look at 33!! Wish I had been clever enough to do something like that when I hit 33..........or even 43!! Still, it's not too late, I've not yet reached 60, but it's CLOSE........VERY CLOSE!! :) I'm definitely doing one when I turn 62 and retire!! Great idea! I turn 30 soon so I should do something like this.